Real Estate Photography is easy peasy point-n-shoot, right? We get that question a LOT. Probably because we spend so much time taking and processing house photographs for our lines of business. The primary purpose of this type of photography is to show the characteristics of the home being appraised. Each appraisal will include a photograph of the street the home is on, the front, back and sides of the home as well as the major areas inside the home (bathrooms, kitchen, living areas). The additional photos in the report are photos of the comps. A typical number of photos for an appraisal report is under 20, and the camera can be kept to record jpegs at a low resolution which do not need additional processing before being inserted into the report. A standard point-and-shoot works great for these shots. We use a Canon PowerShot SD1200IS (10 MP Digital Camera with 3x Optical Image Stabilized Zoom and 2.5-inch LCD). Real Estate Listing photos are taken with all types of cameras, from low-end point-and-shoot models to high-end DSLRs, with varying degrees of success. Interior photographs, if they are to be used for listings will look better if they are either taken by a pro, or if you use a better DSLR and have a lighting set-up that will allow you to shoot interior photos at a lower ISO and smaller aperture (meaning, crisper photographs that are in focus from the front to the back of the room), without ending up with the “flashy” look that comes from using the built-in or pop-up flash on the camera. Although photographs for documenting the ebb and flow of neighborhoods, cities and towns can be taken with any type of camera, the most pleasing images are likely to be taken with a good-quality DSLR and by someone who has taken the time to learn about good composition and exposure (lighting). Taking photographs of streets and houses is not difficult, but capturing the character of the area is harder and takes a little more effort to find the subjects, angles and compositions that tell a more compelling story. Today we’re going to talk about #3: Photographs for Other Purposes, such as Historical Research, Photo Journalism or Neighborhood Profiles. More specifically, we’re going to talk about the basic equipment that will give you better results. Although we take our appraisal photos with a point-and-shoot, we use Canon DSLRs for everything else. Specifically, we use a Canon 5D, a Canon 5D Mark II, and a Canon Digital Rebel T2i. The first two are full-frame cameras and the last one (the T2i) is a “crop body” which means the image sensor is smaller which means each photo has less in the frame at the same focal length as a full-frame camera. This has it’s advantages and disadvantages. The two photos at right illustrate the difference between the two body styles when using the same 20mm lens. We almost always take all three when we go out for an afternoon or weekend to document an area, although a single camera can certainly handle the job. If you want to read up on these cameras, you will find a wealth of information in the reviews on Amazon.com. For very detailed technical reviews and comparisons of the major camera brands, the best source is Digital Photography Review. We try to buy either from Amazon or from Austin’s local camera store, Precision Camera and Video. We usually keep a Canon EF-S 10-22mm f/3.5-4.5 USM on the T2i which is the equivalent of a 16-35mm zoom on a full-frame. This lens is called an ultra wide angle and is perfect for sweeping street scenes, photos of Golf Courses and other times when you want the widest angle possible. This type of lens introduces some distortion to the image, some of which can be desirable as an artistic element and some not so much. Some of the distortion can be minimized “in post” which means when you are processing the images in ACR (Adobe Camera Raw), Lightroom, Aperture or DPP (Canon’s software) when you get home. This camera and lens combination is great for interior photographs that are *really* hard to take, such as inside a laundry room, small bathroom or small bedroom. I sometimes joke that the angle is so wide, you’ll get your ears in the photo if you’re not careful. You’ll most certainly get your shoes unless you’re really paying attention! One thing to note: if you plan to shoot Canon, and you are considering upgrading from a crop body (the Canon Digital Rebel series (XT, XS, T1i, T2i) as well as the 20D, 30D, 40D, 50D, 60D and 7D) to a full-frame (the 5D Mark II and pro-level bodies), you need to know that the lenses marked as an EF-S mount will only work on the crop bodies. Lenses marked as EF will work on all Canon EOS cameras. Make sure to read up on this before you press the BUY button! I keep a EF 24-70mm f/2.8L on my Canon 5D Mark II because I can almost always capture photos where the house completely fills the frame from the street (even from the car!). I can also get a nice close shot of an interesting front door or architectural element in areas with smaller lots (i.e. shallower front yards). This one also works well inside stores and restaurants because it can handle lower-light conditions than some other lenses (due to the constant maximum aperture, or lens opening, of 2.8 across the length of the zoom). Orlando usually has a 70-200mm f/4 L IS (Image Stabilization) lens on the Canon 5D, and focuses (no pun intended) on getting the shots that need to be taken from a distance for best effect. Frequently, these photos are of architectural elements and details on houses or buildings that are farther away. I use this lens to take photos of houses in the distance – such as across a canyon, or to take photos of buildings from much farther away, to reduce the effect of shooting up at a building which gives you an image where the building is tilting away from you. 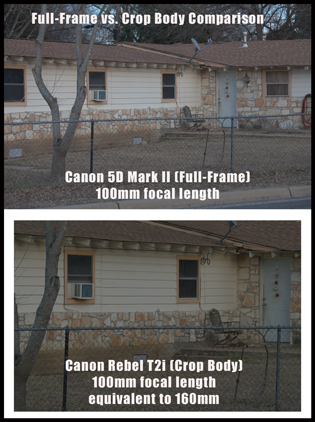 The example photos at right illustrate the difference in images taken at the same focal length (100mm) on a full-frame camera vs. a crop body. These have not been edited and we weren’t trying to take “good” photos, but instead wanted to show the differences you will encounter with camera of differing sensor sizes. Because our 70-200mm lens has a maximum aperture (opening) of f/4, it is less suitable for low-light conditions than a zoom with a maximum f/2.8. The EF 70-200m f/2.8 IS is about $2300 which is why we don’t have it, despite having an actual need quite frequently!! Next year if I’m lucky!! We plan to add a Canon EF 24-105mm f/4 L IS USM lens this Spring, to give us more flexibility. Zooms lenses are usually not as sharp as prime lenses, meaning lenses that have a single focal length such as 50mm. (Primes are heavily favored for portrait photography and for when you can zoom with your feet. They are less fun when you’re walking long distances and don’t want to have to walk over to, or away from, every building, which may mean crossing the street too many times)! Although the EF 24-105mm f/4 and EF 24-70mm f/2.8 have obviously overlapping focal lengths, we find ourselves swapping lenses between cameras too often and would like the option of each having one of these on each full-frame camera, and only swapping out for the longer zooms when it’s time to shoot details with fewer strange angles, water towers in the distance, or stuff far away in fields. We also have wild fantasies about the Canon EF 100-400mm f/4 IS lens, which will be perfect for close-ups of stuff far far away, like the longhorn in a field in Bastrop that I just can’t forget. The 70-200mm just couldn’t get close enough and I wasn’t about to hop the fence!! I consoled myself by taking photos of the fence, which was nice and rusty, the way an old fence in Texas should be. Every where we go, we drag along a Manfrotto 190XPROB 3 Section Aluminum Pro Tripod. We like the quality and stability of the Manfrotto products. When you’re researching tripods, note that most of the better ones do not include the head – you’ll need to make that decision and purchase separately. The head we currently like is the Manfrotto 322RC2 Joystick. The head comes with a quick-release plate that attaches to the bottom of the camera to make putting the camera on and off the tripod much faster. Other premium tripod brands are Gitzo ($$$$$) and Giottos. We replaced ours with Black Rapid straps, which have a single attachment point on the bottom of the camera and are designed to be worn messenger-style. When the camera is on the tripod, the attachment point easily screws off to be replaced with the tripod quick-release plate. You often see Wedding photogs with the dual Black Rapid rig which lets them carry two monster cameras at a time! The Black Rapid straps run between $53 and $65. When you hear someone say their camera is “gripped” you might be thinking, “of COURSE it is gripped – how ELSE would you hold it!!”. What they actually mean is that it has an additional battery grip which screws on to the bottom of the camera, and hold two batteries. In the case of our T2i, it can hold either one battery, two batteries, or 4 AA batteries. More importantly, the grip has additional controls which put a shutter button where you need it when you’re holding the camera in the portrait position (instead of landscape). Once you’ve held a gripped camera, an un-gripped one will feel puny in your hands. I have small hands but adjusted to the grip very quickly and now never take it off. If you’re shooting under conditions where you need the camera extra extra steady, such as in low-light, or with a long zoom, you’ll also want to get a shutter-release cable. This cable plugs into the side of your camera and allows you to press the shutter without touching the camera, which can cause camera shake and prevent tack sharp images. These are inexpensive (under $30) and really do make a difference. The real estate states that my images are too large when they post to the real system that allows people to view the homes. 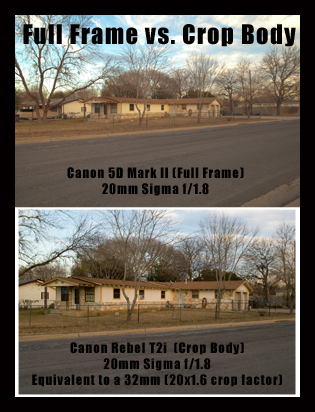 I use a canon T2i with a 10-22 and shoot in s ( small image format). What is the best image format than ? or can i re adjust the image to something smaller? You should use an editing program to save them smaller. If you’re shooting a lot of photos, Lightroom (from Adobe) is a fantastic program.